This Saint was born at Orleans of a very illustrious family. At his birth his parents dedicated him to God, for his mother had been advised in a vision that he would some day be Bishop of the city of Orleans. They took great care to form both his mind and his heart. His improvement in virtue kept pace with his progress in learning; he meditated assiduously on the sacred writings, especially on Saint Paul's manner of speaking on the world and its enjoyments, calling them mere empty shadows which deceive us and vanish away. These reflections at length sank so deeply into his mind that he resolved to leave the world. To put this design in execution, about the year 714 he retired to the abbey of Jumiege in Normandy, where he spent six or seven years in the practice of penitential austerities and obedience. When his uncle, the bishop of Orleans, died, the senate and people with the clergy of that city, begged permission to elect Eucherius to the vacant see. The Saint entreated his monks to screen him from the honors threatening him; but they preferred the public good to any private inclinations, and resigned him to accept that important charge. He was consecrated with universal applause in 721. Charles Martel, to defray the expenses of his wars and other undertakings, often stripped the churches of their revenues. Saint Eucherius reproved these encroachments with so much zeal that in the year 737, Charles banished him to Cologne. The extraordinary esteem which his virtue procured him in that city caused Charles to have him taken to a fortress in the territory of Liege. 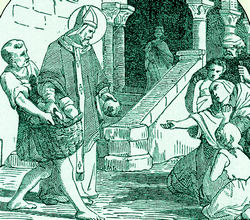 The governor of that country was so charmed with his virtue that he made him the distributer of his large alms, and allowed him to retire to the monastery of Sarchinium, or Saint Tron's. Here prayer and contemplation were his whole employment until the year 743, in which he died, on the 20th of February.